Finally, my images that I made for a ‘rephotography’ commission of Cas Oorthuys’ images of Rotterdam made in the fifties, are installed at the home of their new owner, the Erasmus University. Because of copyright on Cas’ his images, I cannot show his corresponding image here…will post some installationshots asap! This was a commission I did for the Erasmus University, in cooperation with the CBK Rotterdam and the Nederlands Fotomuseum. 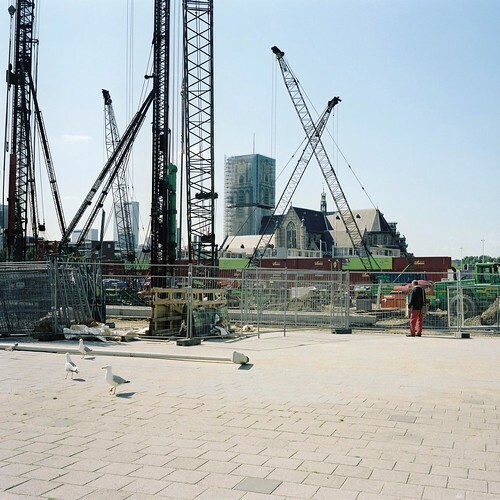 Subject: Binnenrotte in Rotterdam, where they are constructing a huge market hall, with Laurens Church in the background.